The Jazz Composers Alliance Orchestra was established by Darrell Katz and Ken Schaphorst in 1985 as a collective and presenting orchestra. The Orchestra is the resident ensemble of the Jazz Composers Alliance. Over the years, it has managed overall to bring a satisfying balance between original compositions and the improvising aesthetic. Historically, the few bands that have successfully specifically emphasized those two elements have not always managed (or managed for long) to keep a high standard on both. Ellington, Kenton, and Breuker are 3 bands that come to mind as having succeeded and grown old while often encompassing members with long tenures. And while the JCA Orchestra is still relatively young, less traveled, and less documented, when compared with the longevity of those bands, perhaps it would not be hyperbole to begin to consider it (along with the London Jazz Composers Orchestra) on a short list of bands that have successfully and consistently combined the two elements/disciplines of original composition and instant composition/improvisation. 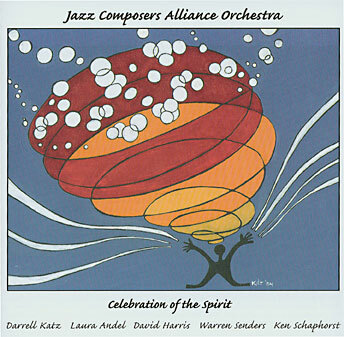 Having worked with Darrell since the early 1990s and taking into account the overall quality of the Jazz Composers Alliance Orchestra’s body of work gave me the confidence to venture out of our usual confines and try to bring our efforts for excellence in artistry and audio to a whole new situation with its very different demands and difficulties. We arrived at The Tsai Performance Center at Boston University a bit after 9:00 a.m. and my anxieties were soon lessened by the timely arrival, pleasantries, and welcome of all the participants. After three hours of setting up, warming up, and sound checks, we began the formal recording at about 12:30 p.m. Here we were on a beautifully crisp fall Sunday morning following a dramatic late night extra inning playoff victory by the Boston Red Sox. Baseball was in the Boston air and, with another do-or-die playoff game in the works for that afternoon, we would be ensconced in The Tsai trying to produce artistic excellence. While this baseball thing should not be given undue notice, it should be taken into account, as evidenced by Bob Pilkington, resplendent throughout the session in a Red Sox hat, and the occasional yawns from bandmembers recovering perhaps from too much BoSox ball the night before. So there was joy in Beantown, the spirits were good, and the adrenaline high as the band opened up with Laura Andel’s Industrial Hearts and its dynamic crescendoing contrast between the pointillism of percussion and reeds set in the great organic birthing of the brass. Laura also contributed Nodes, a fine piece showcasing the band and composition as soloist. Darrell Katz’ Toscar was up next, a piece that sounds informed by Gil Evans and a post WWII modern aesthetic. Ice Time preceded a lunch break, a hip piece punctuated by a rather fun use of percussion. During the break, Takaaki Masuko told me that, as regards percussion, “Nothing was written. I asked Darrell, ‘What do you want me to do?’ and he said, ‘Just play your things’.” Later, Darrell told me he meant for Takaaki to “invent what he did from the drum music (parts)” presented to him. Ken Schaphorst was next to take his turn as conductor, opening with How to Say Goodbye, a lovely piece featuring an effective small group suspended within the larger group, slowly absorbing and assimilating one another into a unified and resolved whole. David Harris’ Th-Outward is a composition built around notated music, visual clues in the form of written instructions (i.e., winds/bones or alto duets, etc. ), and conduction. Remarkably coherent, it alone is proof of the structure inherent in so-called free music and a wonderful synthesis of the first 100 years of creative improvised music. The final conductor/composer, Warren Senders, took over—after a brief break—to present his twopart suite Elegies and Recollections, a sobering round that works into one’s psyche before celebration and final reflection. Composition: Music of the composers’ inspiration that must be played with precision, and interesting and rewarding enough to attract quality artists who must largely give of their time and talents to rehearse and execute. Improvisation: In this situation an artist must, on a moment’s notice, be able to sit outside the group and its composed confines and project in a meaningful, inspired, and individual manner. Recording: It’s a no-net circumstance. What you hear is what was played; real sequencing, real time, real dynamics. This is not a cut&paste edit job, not”the best parts” of various takes. There is no opportunity for an individual (or section) to pull back on any subsequent take(s) after a great statement or first take, thinking that it will be spliced and edited into the whole. There is no opportunity for any artist to trample over others thinking that the engineer will impose the “correct dynamic” and fix it in the mix. These people worked hard for almost 11 hours straight, executing 20 complete takes (all of them with some merit), with no place to hide. This is a document of a real artistic experience. But all that would be of smallnote were it not a wonderful and rewarding concert experience, which this is. It’s easy to get discouraged in this business, but working with this group—these 21 individuals—is the kind of endorphin that combats discouragement. For the artists, this producer, and now you, the listener, this isa reaffirming celebration of the bright spirits.